In the Netherlands, a multi-modular plastic road offers a cleaner and environmentally friendly alternative to asphalt. 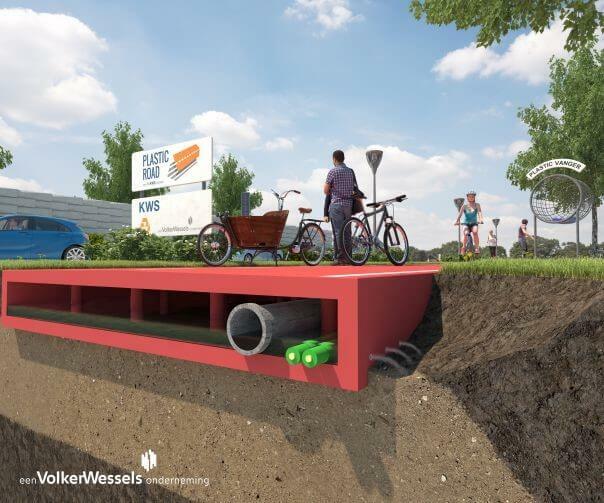 Dutch firm VolkerWessels presents a truly innovative concept: to build roads made of plastic taken from recycled waste found the oceans where great quantities of trash pose a serious threat to ecosystems. This concept addresses with two important environmental issues, pollution of the seas caused by plastic waste and recycling. The PlasticRoad solution offers an alternative to carbon intensive asphalt for road pavement based on the Cradle-to-Cradle concept: designing products and systems through a holistic approach enabling them to be more efficient and waste-free. Recycled plastic is presented as a viable solution because it would be transformed into prefabricated components that are then installed on sand – a procedure that makes the construction of a road much simpler and quicker. Construction and maintenance are made easier. PlasticRoad is meant to be more resistant against corrosion caused by the impact of vehicles and elements (rain, snow, extreme temperatures as low as -40° C and as high as 80° C). With lifetime estimates at three times that of traditional roads, traffic would benefit in terms of lesser road works and traffic jams. Plastic road components would act as normal road pavement and they can have hollow spaces inside the structure for cables, wires, water pipes, measuring instruments and traffic loop sensors. This integrated approach is a good example of how recycled materials can be used to offer higher endurance, faster and more efficient construction time, and space for additional components and instruments made to improve its functioning and viability. 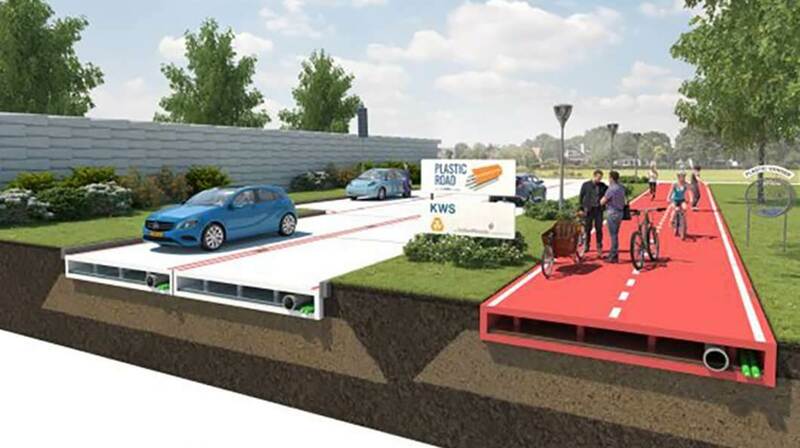 While still at a conceptual stage, the Netherlands could be the first country to develop a PlasticRoad prototype. The port city of Rotterdam is keen to support innovation and sustainability-related projects with a “street lab” and could provide an ideal testing ground for such a pilot. To develop and consolidate the project, VolkerWessels is recruiting partners from the plastic industry, the recycling sector and universities. When thinking of ways to reduce the carbon footprint of the transport sector, the first things to come to mind are vehicles and the quest for alternatives to fossil fuels, such as biofuels, electric and hydrogen cars, as well as the shift from road to rail transport for passengers and freight to reduce traffic and pollution, and the use of more efficient and greener materials to build vehicles. PlasticRoad, however, shows that working on the infrastructure at a large scale can lead to a reduction of the carbon footprint by intervening in the production cycle, in this case by replacing carbon-intensive asphalt with recycled plastic currently polluting the oceans. Improving the quality of the infrastructure for its users will facilitate the fluidity of circulation and traffic by lowing maintenance needs. Learn about the solutions that exist today in making mobility more sustainable at our special international exhibition in Brussels during and after the European Mobility Week (16-22 September).